Trailers, gameplay videos, and more are now available for Hulu users on the PC. Hulu offers the ability to stream plenty of movies and TV shows, but starting today you can also view lots of trailers for newly released and upcoming games on its brand new video games hub. In addition to trailers, users can also browse a list of games releasing this month, watch game reviews from X-Play, and browse Hulu's available geek culture-related media. "In case it's not clear, we love video games at Hulu. So for this busy video game season, we've got you covered," Hulu's Oscar Rohena wrote in a blog post announcing the hub. 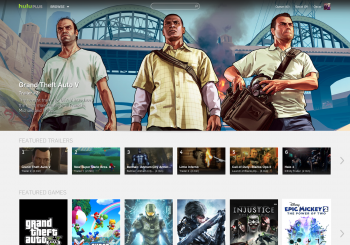 "In the video games hub on Hulu, you'll be able to find beautiful pages featuring HD trailers, gameplay videos, and reviews for the latest games. We'll also have essential release information, so you know exactly when you can get your hands on that game you're eyeing." Clicking on any game on the main hub brings you to that title's standalone page, which has release, rating, developer, and publisher information and collects all of the trailers available for that game. You can also scroll through lists of popular and recommended games, though I have no idea what the recommendations are based on. The video games hub is only available on the PC right now, with Hulu planning to bring it to other Hulu Plus-enabled devices over the next few months.